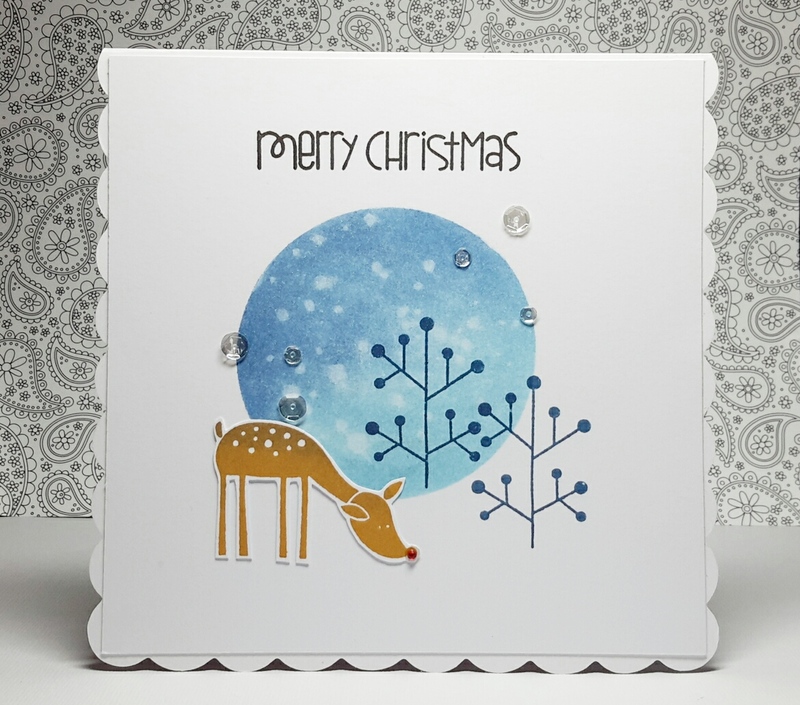 Wishing you all a very Merry Christmas and the Happiest of New Years!!! 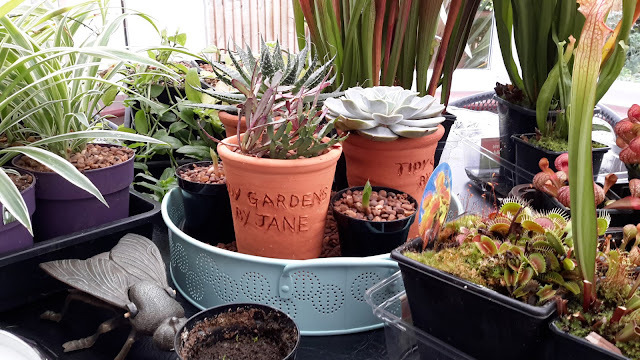 So almost everything that was enjoying life in the ol' greenhouse has been bought indoors into the conservatory to be enjoyed and fawned over during the winter months. 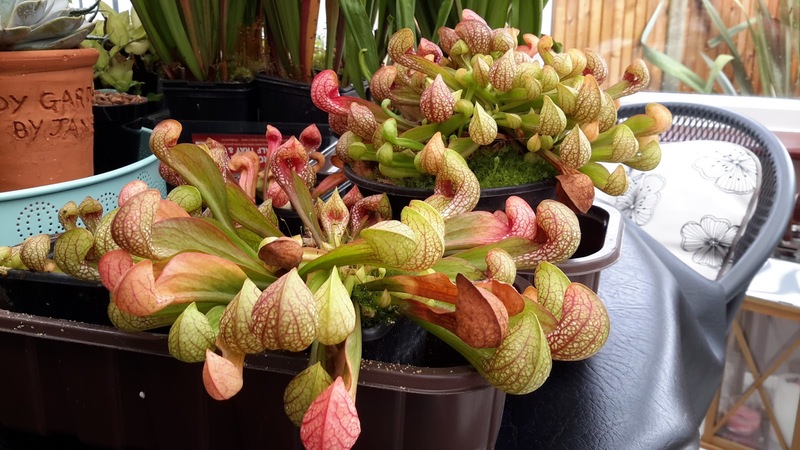 My carnivorous collection has grown, purely by division of each plant. These are Sarracenia Psittacina (Parrot Pitcher) and, like my entire collection, maintenance is miniscule.....just make sure the pot is always sitting in rain water. I divided one of the larger ones earlier this year in to 4 and you can see already how quickly they have grown. 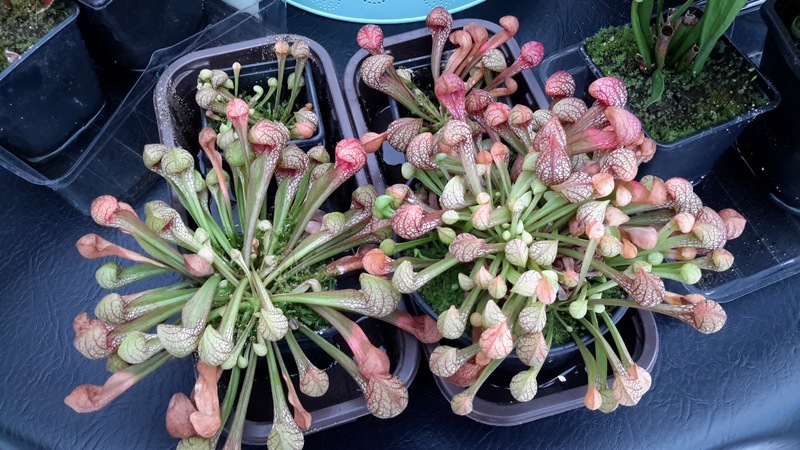 I use a special carnivorous plant soil from a local garden centre, about £3.00 for 2 litres. 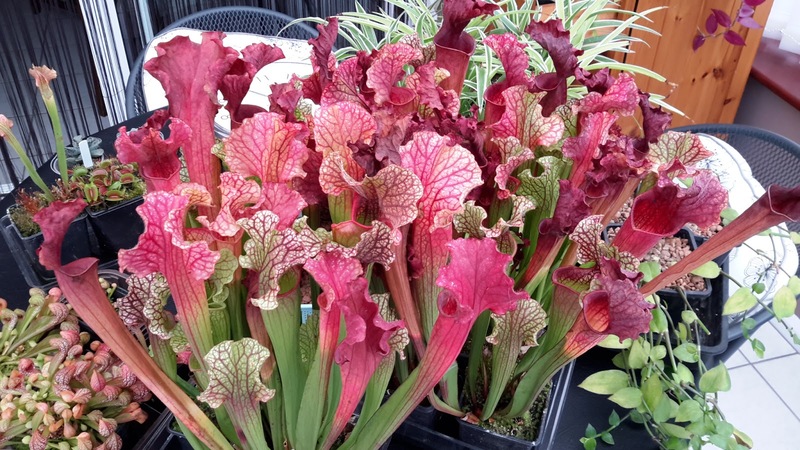 These are the more regular, erect Sarracenia, or Trumpet Pitcher. I originally had 1 plant but have divided it a couple of times as it's so successful. I think I have about 6 now. Again, these are dead easy to look after. This is really exciting, maybe not the most exciting photo but those little green shoots are mahoooooosively exciting!! 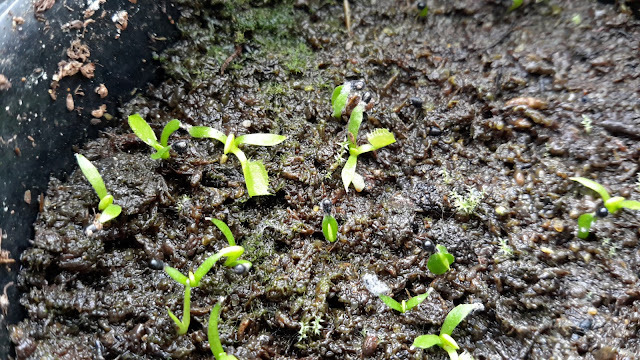 They are baby Venus Flytraps. I have one plant that has flowered each year (see post here ) and this year I collected the tiny seeds, layed them on top of some moist carnivorous plant soil and popped a clear lid over them (you could use a clear sandwich bag) . They've just sat in the greenhouse all summer and now they've sprouted I've removed the lid. Look closely and you can just about make out the minute traps, they're about 4mm long... I'm thrilled!! 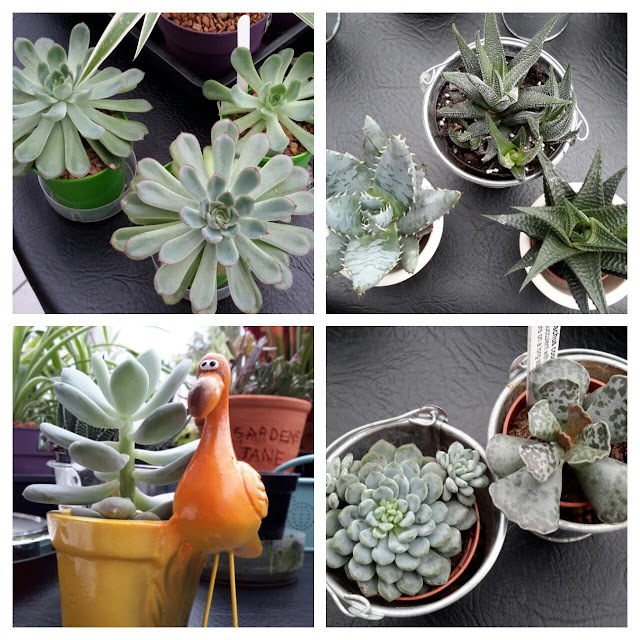 Succulents are another passion, especially propagating. My kitchen windowsill is adorned with a selection of individual leaves waiting for them to sprout roots (full instructions here). I will do a separate succulent post soon as I have more en route as I scribe. Thankfully Mr TG has embraced my addiction to plants (it's that or move into the shed...him, not my plants 😉) and this year for my 21st birthday (Cough!) he organised the most amazing gifts. 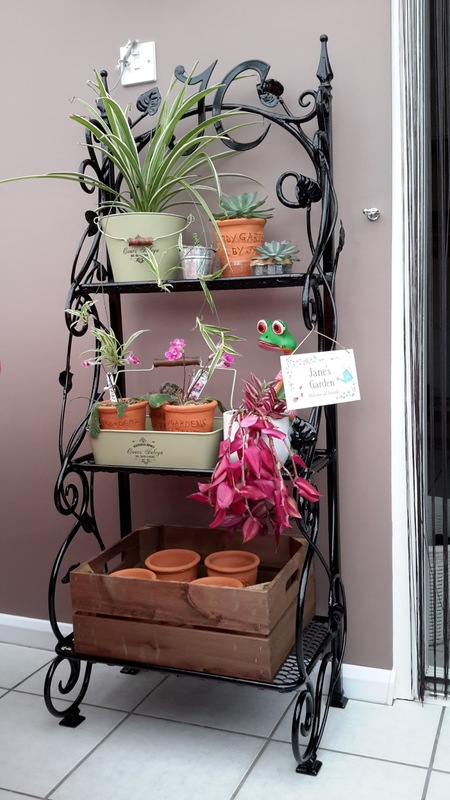 This is one of them, a handmade, cast iron plant stand, designed by Mr TG and personalised with my initials (JC) at the top. Thinking that nothing could beat my new plant stand, he then produced a wooden crate full of personalised, hand thrown, clay flower pots. Each one has 'Tidy Gardens by Jane' engraved on them. Honestly, 21st birthdays (Cough! Splutter!) are the best. They are from Littlethorpe Pottery here in Blighty. 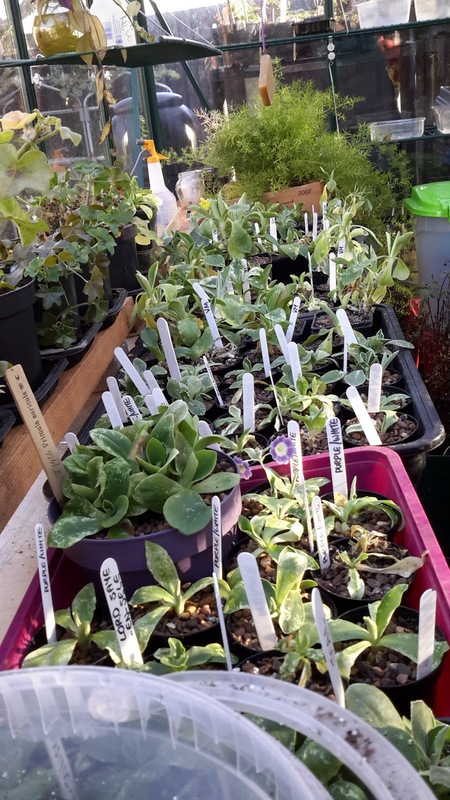 These were meant for my Auriculas but as I have so many (170 at the last count...Ahem!) 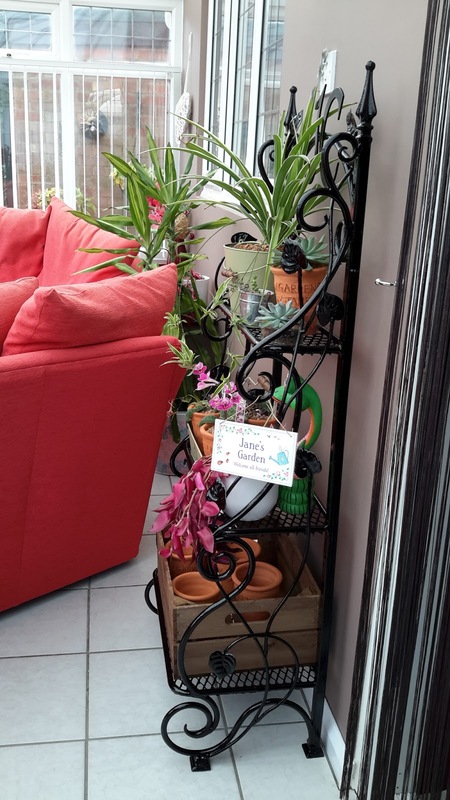 and because these pots are so special, I have used them for my growing indoor plant collection instead so I can look at them everyday. Meanwhile in the greenhouse, my Auriculas are beginning to cast aside their tatty autumn look. 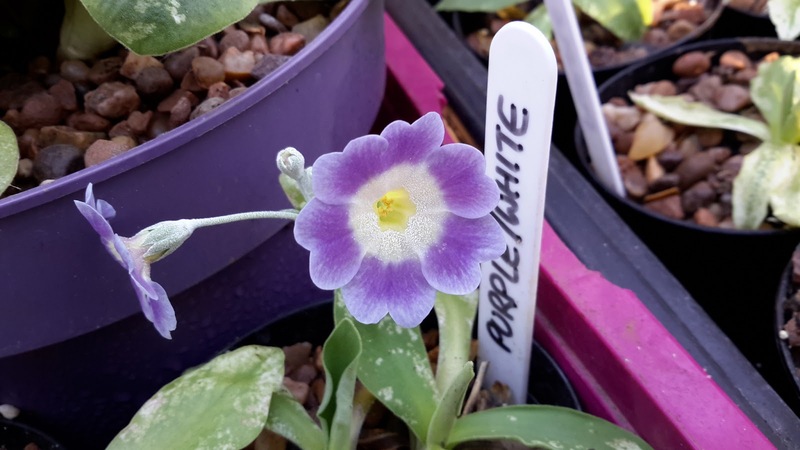 That's the only downside with Auriculas, they can look half dead during the autumn / early winter months but they more than make up for that shabbyness when fresh, green leaves and blooms to-die-for arrive in early spring. 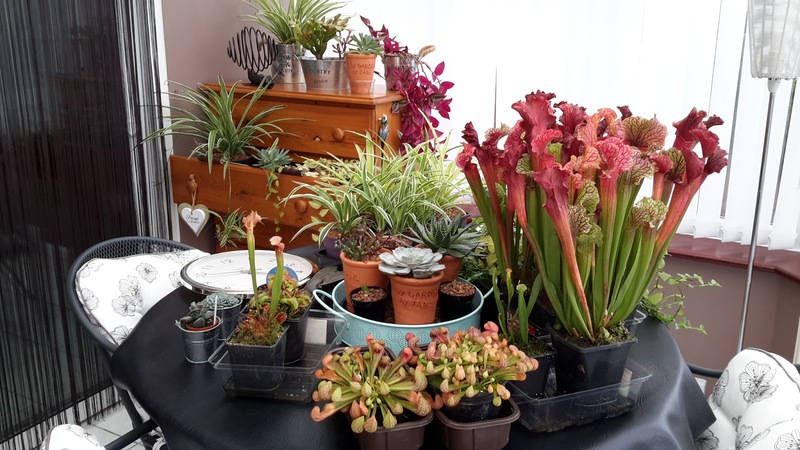 I've repotted and divided them all this year and yes...guilty m'lud...I do have about 170 now. 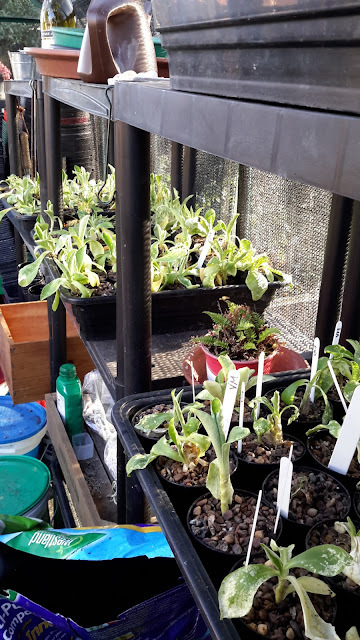 I've bought them all into the greenhouse this winter (you don't have to do this!!!) purely to have them all together so that I can enjoy their flowers in one place. They normally sit on an old, plastic shelving unit outside at the end of the garden over winter but it's not the most glamorous place to sit n' coo over them. 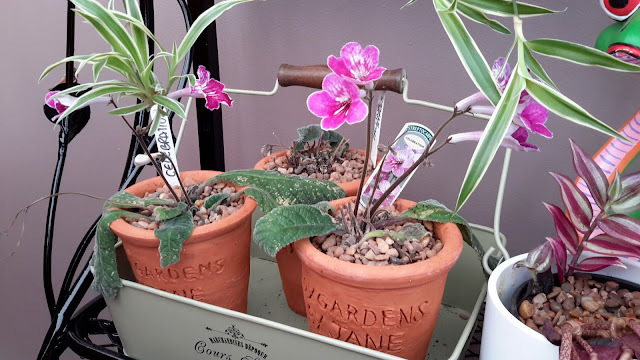 They don't mind the cold one bit, so I thought I'd put them in the greenhouse all together, where I have a chair for pondering life, the universe n' everything. Here's one that's already started to flower and you'll see why I love them so much. 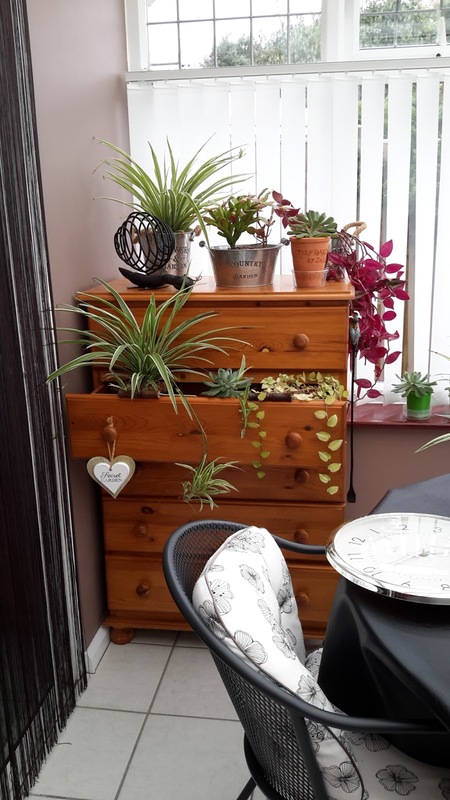 Finally, a bit of upcycling.....this is a set of drawers that are now redundant in our house but they have sentimental value to me, so I've started using them to display some of my houseplant collection.